About 10 years later, I immigrated to Israel, which in Hebrew is referred to as making aliyah (going up). By returning to my Jewish homeland, I became an official part of the Jewish state with a front row seat to Jewish history. Aliyah is also the word we use for going to Jerusalem, rooted in the past when the Jewish Temple stood and Jews would “go up” to Jerusalem to make sacrifices and serve Hashem. This year, hours before Yom Kippur, the holiest day on the Jewish calendar, I made my third aliyah, ascending to the Temple Mount. The experience was exciting and powerful, but it was also tinged with sadness and frustration, and in the end, hope. For the Jewish people, an aliyah to the Temple Mount represents the pinnacle of sanctity. As Rabbi Daniel Sperber, spiritual leader and teacher of Talmud and Jewish custom previously explained to me, “there is in Jewish thought a hierarchy, a spectrum of sanctity, based in the Mishnah (oral Torah) that says there are degrees of sanctity,” a concept called kedushat hamakom (sanctity of space). In Judaism, the Temple and its holy of holies was the most sacred place in the world – the place where God gathered dust to create Adam, the first human, the site of the binding of Isaac and where God’s divine presence is most revealed. There, during Temple Times, the Kohen Hagadol (High Priest) would make sacrifices on behalf of the Jewish people. Jews and non-Jews alike would bring sacrifices on Yom Kippur, as well as for the festivals of Pesach (Passover), Shavuot (Feast of Weeks) and Sukkot (Feast of Tabernacles). Until today, even in light of the destruction of the First and Second Temples, Jews pray toward this site and aspire for the rebuilding of the Third Temple. Leading up to my third aliyah, I spoke to Jewish activists, politicians and rabbis about the Temple of the past and future to better understand the importance of what I was about to do. Each maintained that the greatest step Jews and Christians can take to usher in Geula (redemption) is to take the possibility of a Third Temple seriously by yearning, praying and advocating for it – as well as by ascending to the Temple Mount. He explained that Jews and Christians can only go up to the Temple Mount during certain days and hours and they are not allowed to pray there, although the Jordanian Waqf (an Islamic religious endowment that monitors the site) sometimes ignores quiet prayer during times of relative calm. As he spoke about the significance of going up to the Temple Mount, I understood that ascending would be meaningful religiously as well as an effective way to show the world, including Israel’s leaders that Jews seek to connect with our holiest site. Outside of praying for a shana haba’a b’yerushalayim (next year in a rebuilt Jerusalem) after Passover and Yom Kippur, this would be my first active display of yearning. Once I decided I would go up on the Temple Mount, I needed to choose a date and time to do so. Similar to the concept of sanctity of space, there is also a concept in Judaism called kedushat hazman (sanctity of time). As Rabbi Sperber told me, Yom Kippur is the most sanctified time on the Jewish calendar, followed by festivals and Shabbat. So with the holiest day of the year soon approaching, my aliyah date became clear to me – I would go up as close to Yom Kippur as possible. As the Temple Mount was not open for Jews on Yom Kippur itself, I would go up just hours before the holiday. On the morning of the big day, I arrived to the one entrance allowed for Jews. After going through a metal detector, I had to leave my identification at the entrance and was met by my guide, Michael Miller, as well as accompanying Israeli border guards who were tasked with keeping us safe and ensuring that we would follow strict rules: maintaining modest behavior and dress, not praying out loud or straying from the group and moving aside for Muslims, who are given the “right of way” on the Temple Mount. “It is a miracle that we can come up here,” Miller told our group. As we were given the green light to go up the ramp towards the Temple Mount, everyone began to clap and sing. Once we entered the Temple Mount platform, we saw the Dome of the Rock – a 7th century CE Islamic shrine built on top of the even shtiya (rock of foundation) and considered by most authorities and scholars as the location of the Temple’s holy of the holies. As we toured around the area, the police surrounded us in what seemed like a combination of herding, hurrying and protecting. The waqf, dressed in white shirts, stood watching us from afar. As we reveled in our holiest site, some attempting to pray under their breath, Muslim children played soccer just meters away. While I understood and truly felt the importance and potential of the Temple Mount, I was saddened by how far it is from a place of prayer for all nations. Jews and Christians, while protected, have few rights. The political tension is palpable, impeding one’s ability to connect to God in the place that one should be able (and allowed) to feel it the most. After taking some pictures and walking around the Temple Mount platform, we dedicated the aliyah to our good friend Ari Fuld, an American-Israeli Jew who had been murdered just days before. As an activist, Fuld had reported on assaults against Jewish members of Knesset who went up to the Temple Mount, treatment of Jews by the Waqf and arrests of Jews for praying on Judaism’s holiest site. Then, we were briskly led out, walking backwards toward the exit as to not turn our backs on the Holy of the Holies. At the exit, there was a short prayer service and we were led back to our starting point. With just 20 minutes left before the closing of the Temple Mount for Jews, we were asked if we wanted to go up again – most of us agreed, and we went up once more. This time, we were allowed to take pictures closer to the Dome of the Rock, the Muslim mosque that today sits on the Temple Mount. But the police stopped us from going up the stairs toward the dome, which is forbidden for Jews. As I reflected, I came to understand the connection between my three aliyot. 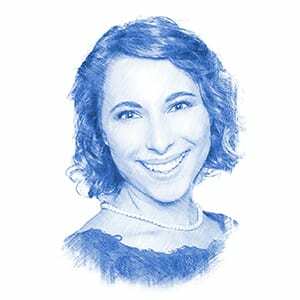 Upon my first aliyah – my bat mitzvah – I assumed responsibility for Jewish law, ethics and tradition. I assumed a Jewish consciousness and entered into Jewish life as a fully-fledged member of the community, with all the responsibilities that come with it. That aliyah led me to immigrate to Israel. I fulfilled the main aspiration and tenet of the Zionist movement – to settle the land of Israel. That second aliyah led me to my third, ascending the Temple Mount where I stood at the nexus of Jewish responsibility, agency and consciousness, in pride, excitement, sadness and frustration. I do not know what my next aliyah will be. But I do know that I now have a deeper understanding of the Jewish vision and hope that next year we will see a rebuilt Jerusalem.